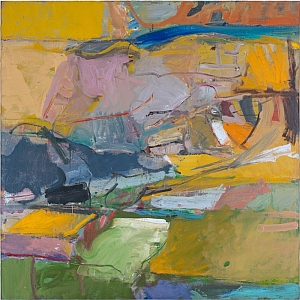 Richard Diebenkorn grew up in San Francisco and attended Stanford University, and later the California School of Fine Arts (now the San Francisco Art Institute). Although well established as an abstract painter, Diebenkorn returned to figuration in the mid-1950s. He incorporated the dominant expressive painting style into representational canvases, often landscapes. In 1966, he moved to Santa Monica and returned to quasi-geometric abstraction, though his work continued to evoke the landscape and the hazy coastal light of Southern California. Like his earlier works, Diebenkorn’s later abstractions allow the accumulated drawn and painted traces of his painstaking process to remain visible. In 1988, he returned to live in Northern California, where failing health forced him to concentrate on small-scale works until his death five years later.